Communities in Lamjung District discussing the environmental and social assessment of the Marsyangdi Corridor. Photo: Accountability Counsel, 2018. Indigenous communities in Nepal's Lamjung District are concerned about plans to build the 220 kV Marsyangdi Corridor transmission line and other hydropower generation projects and transmission lines that would cut through the Himalayas, including through Nepal's largest protected area -- the Anapurna Conservation Area. 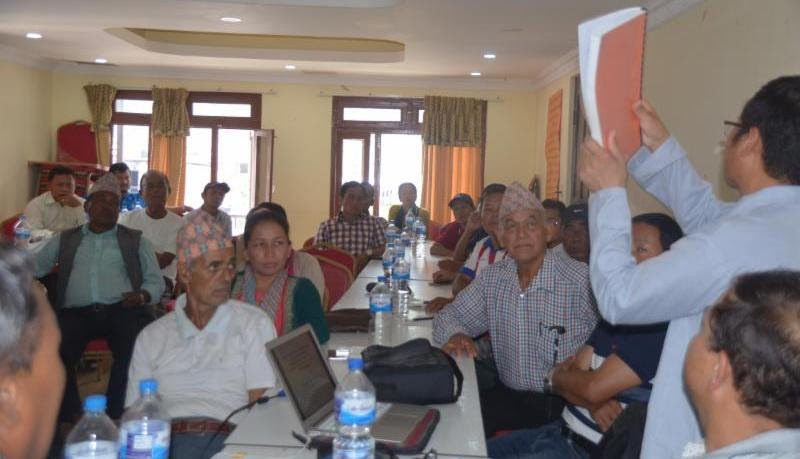 Community members called for help from LAHURNIP, to ensure that the voices of Indigenous Peoples are heard in the debate around hydropower sector development in the Marsyangdi river system. The 220 kV Marsyangdi Corridor transmission line project is being funded by the European Investment Bank (EIB) as part of the Nepal Power System Expansion Plan. Community members are worried that this and related hydropower sector projects in the area are not following EIB's environmental and social rules that require Free Prior Informed Consent (FPIC) from affected Indigenous Peoples. ELAW Staff Scientist Dr. Mark Chernaik consulted with Advocate Shankar Limbu at LAHURNIP, and Mr. Siddharth Akali at the Accountability Counsel, and analyzed the Initial Environmental Examination (IEE) for the proposed "Marsyangdi Corridor (Udipur - New Bharatpur) 220 kV Double Circuit Transmission Line." The safety risks to citizens are understated. Stakeholders who live along the project path were not consulted. Wildlife within the project area were not adequately assessed. The assessment of impacts on forests is not adequate. Geographic coordinates provided for the transmission line were incorrect. No measures are in place to prevent the electrocution of rhesus monkeys that could climb transmission towers. The project is part of a much larger transmission line project, but no analysis is made of the cumulative impact as required by Nepalese law. 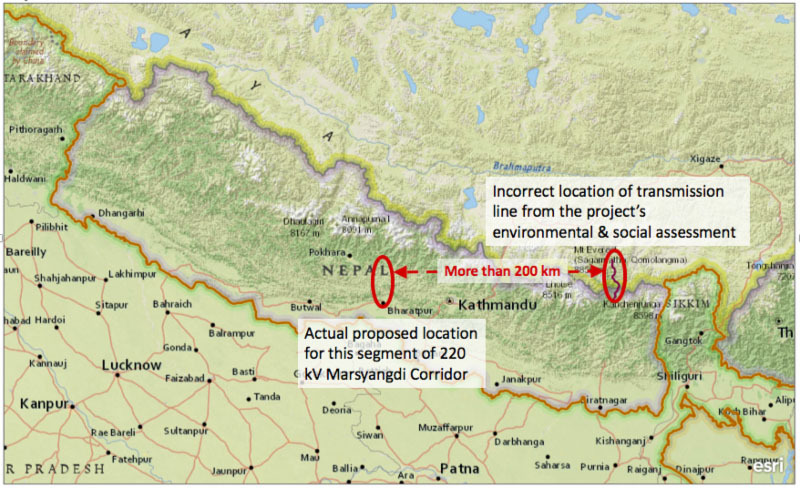 Map comparing the actual location of the 220kV Marsyangdi Corridor to the incorrect geographic coordinates provided in the environmental assessment. "Thank you for this detailed and insightful analysis. This is tremendously helpful! LAHURNIP and Accountability Counsel shared your analysis with the communities. The communities felt empowered by your analysis and kept referring to it. LAHURNIP and Accountability Counsel have had an extended summary translated for the communities. The communities said it's going to play a cornerstone role in their advocacy." ELAW will monitor decisions about the proposed power line and stand by to support LAHURNIP. Thank you for your interest, and we will keep you informed about our work in Nepal and around the world to ensure that indigenous voices are heard.